“Father Flanagan Laments” by Denny Goetz follows the seriously flawed character of Father Emery Flanagan, a man of the cloth who longs for godliness while bordering on pedophilia. Father Flanagan documents his personal struggles in this diary with great detail, right down to his irritable bowel syndrome, which it turns out, is quite frequent. In fact, this book is mostly about—Father Flanagan's sexual repression and the stress it causes, which seems to be dispersed through his bowels. In a book that focuses so much on a single character, you would think the character would be more likable or at least more interesting. However, I found Father Flanagan sometimes boring, gross, and whiny. The only interesting thing about him is his sexual repression, which is actually a little disturbing. A side note here...if you haven't figured out yet that there is a lot of sexual stuff in this book, well, there is, and some of it borders on pedophilia. Really, I kept reading to find out whether or not Father Flanagan stays true to his faith or gives in to his human nature. The book becomes progressively darker as the story goes on. The author does do a great job of allowing you access into Flanagan's mind. This lets you feel his pain in a convincing and authentic way even if the character himself is a little over the top at times. Generally, I like stories that focus on the perspective of a single character. I also enjoy satire and I am not easily offended by religious or sexual shenanigans. If you are however, then this might not be a book for you. 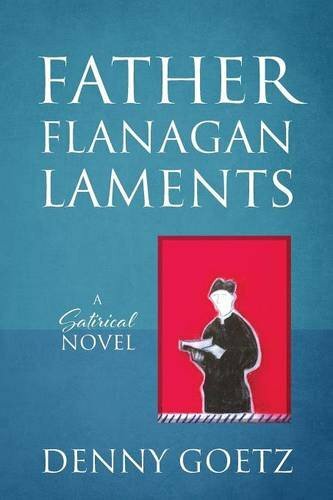 On the other hand, if dark satire is your thing, then you will enjoy “Father Flanagan Laments.” Personally, I found that while “Father Flanagan Laments” contained some excellent writing and solid character development, it lacked a substantial plot. I wish I enjoyed this book more as it contains quality writing, and it is not exactly a short read. Unfortunately, in my opinion the vulgarity and potty humor was just for controversy's sake, instead of contributing to the story. I give it 3 out of 5 stars, as it has potential, but not enough follow-through. Still, for those who cannot get enough of satire or dark comedy they might find something here. I found it to be a bit cumbersome and too long of a read just to find out if Father Flanagan decides to act on his desires or not. In short, this could have been a great short story instead of an okay novel for me, but for readers who enjoy dark satires, and potty humor, “Father Flanagan Laments” by Denny Goetz is a well written and character developed read they will enjoy.